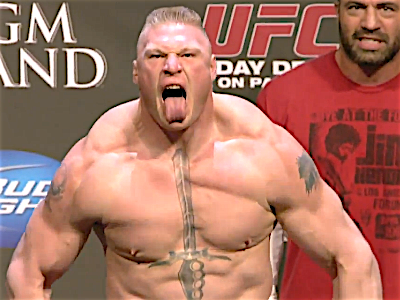 So it looks like the Brock Lesnar rumors may be true. There is some doubt he will make it to WWE’s SummerSlam in August to almost certainly lose to Roman Reigns. The issue with fans is going to be that he is coming back off of a suspension from a failed USADA drug test back at UFC 200 that turned his victory over Mark Hunt in to a no contest. Why would that be such a big deal you ask? Dave Meltzer is reporting that Brock may show up at UFC 226 and call out the winner of Daniel Cormier vs Stipe Miocic. Lesnar has not earned the right to face a champion. Stipe is the current heavyweight champion and if Cormier wins he will take the mantle so Brock failing a drug test and getting a heavyweight title shot is ludicrous. There are others in line that have earned it but as we all know – Lesnar equals buy rates. Only WWE and Dana White know if Brock is coming back to the UFC so tune in at UFC 226 and find out. It sounds legit so we will be watching closely.